1. I Don’t Know How She Does It by Allison Pearson. Although some see this book as fanning the flames of the Mommy Wars (more on that tomorrow), I thought it was a terrifically funny – and moving – portrait of the over-stressed working mom. See yesterday for more on that one. 2. Disgrace by J. M. Coetzee. This is, in my opinion, a masterpiece and one of the very few novels I’ve read more than once (three times actually). It provides a stark, haunting portrait of a middle-aged man coping with disillusionment (both personal and professional), longing, fatherhood, and masculinity…all set against the backdrop of a post-apartheid South Africa. Again, not everyone’s cup of tea – many people can’t stand the notoriously aloof Coetzee – but I discovered new layers of meaning with each additional read. I don’t always agree with the choices for Booker Prize, but this time I did (Winner: 1999). 3. To Kill A Mockingbird by Harper Lee. It’s hard to believe that this is the only book that Lee ever wrote. I wouldn’t necessarily have chosen to re-read it – feeling I’d done my duty back in 9th grade when it was assigned in every freshman English class in the United States – but I re-read it in one of my book groups and was really glad that I did. In addition to all of the usual themes of childhood, race relations and the morality of violence, this book offers a glorious peek into the Depression-era American South. 4. We Need to Talk About Kevin by Lionel Shriver – This one may be more familiar to British readers, even though it is set in America. It tells the story of a mother coming to terms with her psychopathic son. Like Disgrace, this is a pretty dark tale, so brace yourself before reading. I’ve only read it once but feel like it demands a second read. 5. Anything by Jane Austen. I am always drawn to the Stuff White People Like website, where the authors make fun of (upscale) white culture. Check out today’s entry on the Vespa Scooter. 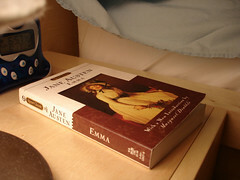 Image: Jane Austen’s EMMA by Allie via Flickr under a Creative Commons Website. Dorothy Dunnett’s Lymond and House of Niccolo chronicles almost demand re-reading. They are so incredibly plotted – you read them first just aching to find out what happens and then again to catch all the clues and connections you completely missed the first time out. Harry Potter for the same reason albeit a different experience entirely. Delia, I would LOVE to be your “friend” on GoodReads. It’s a social networking site where readers share the books they’re reading – and why! Look me up if you sign up – some day my life won’t be this chaotic – and then I’m going to need all the good books I can get! Thanks Kathy. I’ll have a look. There’s something similar here called “book tribes”-a friend of mine runs it-but I’ll check out GoodReads as well! I TOLD you that you’d be captivated by Kevin! Have been meaning to email you for ages to tell you how much I’m enjoying your blog… figures that it would be the book thing that would finally pull me out of passively lurking. :) Your voice is so beautifully present in your writing that I feel like I can hear you speaking every word… such a pleasure! Hey Rebecca! Great to hear from you–lurk away! Actually, I re-read Persuasion and got a lot out of it the second time around, but I take your point.